Do you enjoy cooking? Are you looking for some new recipes? Rebel Ink has the book for you! Through the ages food has been seen as a way to commune with others, bringing fellowship to the table while nourishing the body. Food is key in celebration and in honoring. Its also been commonly widespread everything from asparagus to honey to chocolate and oysters hold aphrodisiacal properties. We at Rebel Ink Press believe not only is food nourishment for the body and fuel for romance, cooking is one of the sexiest and most nurturing things one can do for another. It’s the way to the heart. 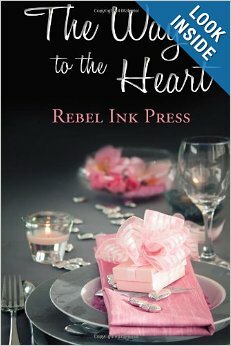 Rebel Ink Press presents The Way to the Heart, a collection of recipes from twenty-six Rebel writers, our charitable project for 2013. For every copy sold a charitable donation will be made to help nurture families and communities around the world through Heifer International. Thank you for your purchase. By opening your heart, you’ll find the way to someone else’s. I have a wonderful mandarin orange salad in this book that has a sweet and sour dressing. It's sure to please even the toughest salad fan! Get your copy today!